That no child will go to school without proper clothes. To be a major source of compassion, information, and emergency support for those living within the Corona-Norco Unified School District boundaries who are facing a personal crisis that threatens their stability, safety, housing, and health. The Corona-Norco Settlement House is a non-profit charitable organization that provides for the temporary emergency needs of the low-income families and individuals who reside within the boundaries of the Corona-Norco School District. 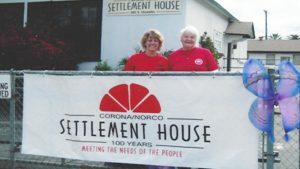 The Settlement House, an outgrowth of Associated Charities, was founded in 1912 to provide aid to the itinerant farmers coming to Corona to work in the citrus groves. The agency was renamed the Settlement House in 1918 to maintain a program of home education and relief among the needy. Our focus has always remained the same: to help those in need. Programs offered by the Settlement House have evolved to meet the needs and resources in the community. Given recent economic instability, those resources are quickly drying up. Now, more than ever before, the low-income families in our community need your help!